My first card shows how you can stretch your Die-namics to create a colorful geometric pattern, just a fun way to add some interest to your designs. I used the Die-namics Essential Slanted Sentiment Strips to die-cut several strips out of colored card stock and carefully aligned and glued them on a white card stock panel. I chose rainbow colors for this card, but you can use any color combination you like best. 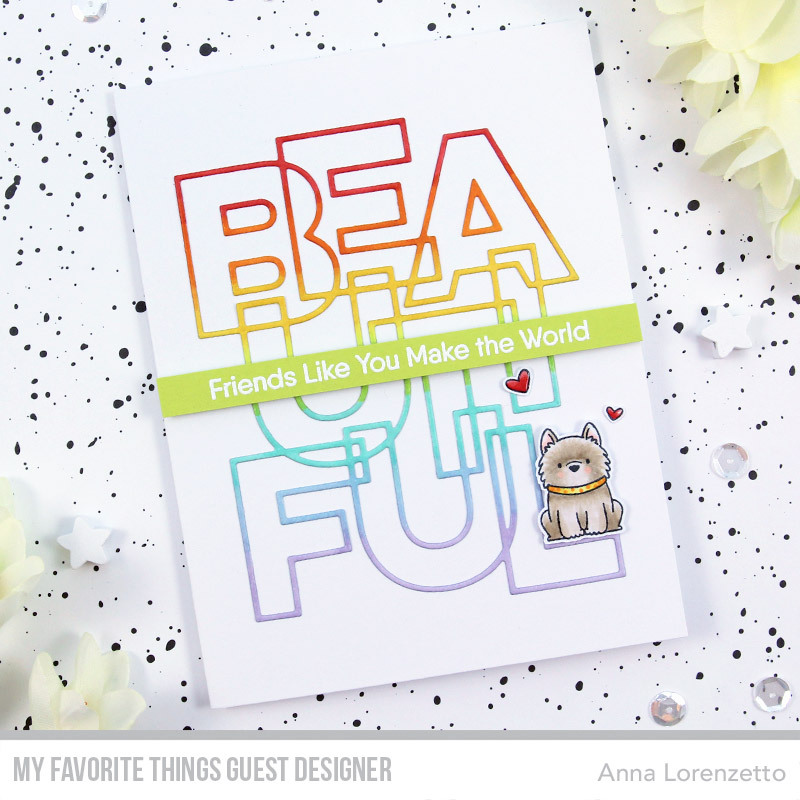 I used the Hello, Beautiful stamp set and the coordinating Die-namics Beautiful to create the sentiment. I die-cut the bold “beautiful” script out of white sparkle card stock and heat embossed the first part of the sentiment in white on black card stock. Since I wanted to make the sentiment pop out, I framed the focal point of my card with one of the Die-namics Single Stitch Line Rectangle Frames and trimmed the colorful background down to fit the die-cut frame. Finally, I mounted the frame on a card base, previously splattered using the Distressed Patterns stamp set, and added some sparkling clear sequins as embellishment. For my second project I used the amazing Die-namics Bold Beautiful. This gorgeous die can be used in many different ways and I think it’s just perfect to create colorful eye-catching designs. I die-cut the intricate “beautiful” word out of white cardstock and colored it in rainbow colors using Copic markers. Then, I heat embossed the leading sentiment, from the Hello, Beautiful stamp set, in white on a strip of green cardstock and foam mounted it in the middle of my card. Your comments are appreciated, please visit my IG account (@al_handmade) to share your thoughts on these projects.